Whether you are a new blogger or a seasoned vet, learning how to use tailwind to grow your blog traffic is one of the easiest ways to get eyes on your blog. I am sure you have heard that page views don’t matter, however, starting out they definitely do. Page views are how you get your content out there. People see your stuff, love your stuff and in turn share your stuff so even more people can see and love your stuff! Sounds easy when I put it that way right? And lucky for us it is. Get your content out there and often. Put it on all different channels so you are able to introduce yourself to just as many people as you can. So we are looking for quick and easy ways to get those page views to your site and when it comes to Pinterest, Tailwind is the way to go. If you want to grow fast, then the more people that see your content the better. Our job right now is to get as many people as we can to see what you have to offer. Your job is to snag those people so they are not just random visitors but dedicated fans that will follow you for life. And that is what we call growing your email list. You have a brand new blog post and you want to share it with the world. Pinterest is the billboard that you can use to get it out there. Tailwind is the easiest way to get your new content on as many billboards as possible. But more importantly, you want those billboards to be on roads (your boards or group boards), that your readers are specifically on. If you have a blog post that is all about travel, then a board about gardening is not the best place to be. You want to instead choose a board that is on traveling so your post resonates with your travel-loving readers. But I am getting ahead of myself just a bit. Pinterest is a process. A step by step way to get fans to your blog. That is after all the hardest part and the reason why Pinterest is so important to bloggers. It is a search engine that is more visual than Google. A search engine that is based on images and titles, keywords, and visual impact. Learning Pinterest is a science but not a difficult one. Learn the steps and how to follow them, then create a roadmap that fits your blog and your schedule. Most importantly follow that roadmap each time so you have a consistent Pinterest game plan that works just for you. 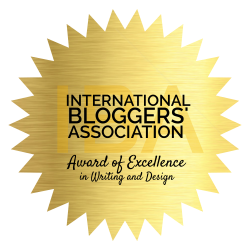 As with all things in the blogging world, one size does NOT fit all. You need to see how things are done and find a way that works best for you and your blog. Let’s first lay out the workflow of Pinterest. Follow the steps to writing a compelling post that is laid out in a clear and easy to read way. Are you having trouble coming up with ideas? Then this FREE guide will help! 120 blog post ideas that you can use today. Your goal with each post is to help your readers with any problems you foresee your readers having. Step #2 – Create a Pinterest image. Right now, Pinterest is loving the size 300 x 900. A little longer is okay but not too much. Next, you want your image to really tell what your blog post is about without any words. 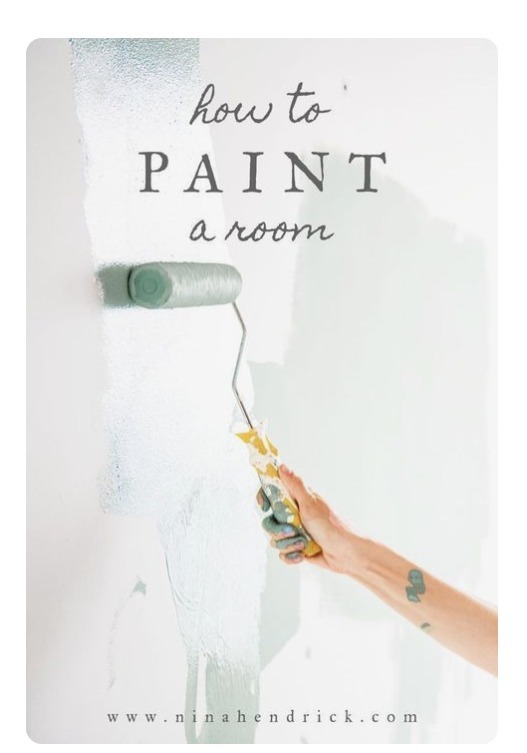 So if your post is about How to Paint Your Family Room, then an image of a paintbrush on a wall is a great one to use. Remember, Pinterest is a visual tool and that means your image is the most important way to tell Pinterest what your blog post is about. Always choose an image that is specific to your post and visually telling to help Pinterest know quickly where to put you and who to show you to. Step #3 – Use a title that grabs your readers. This is another important part of your Pinterest pin. The image is more for Pinterest whereas the title is more for your readers. You have only a small amount of space for your title so choose words that pack a punch and really draw the Pinterest user in so they WANT to see what your post is about. Step #4 – Use keywords and hashtags. These two things are another way to help Pinterest know what your post is about. Remember that travel post we talked about earlier? When you are writing up your description for the pin make sure to use keywords that help flag your content easier like travel, travel tips, travel hacks. Step #5 – Get it out there! As soon as your post is completed you will want to get your content out there. If we are looking at Pinterest specifically then we want to get that pin onto a board that you have created that is specifically related to the subject your blog post is about. Wow, that’s alot…right? Well, not really! Look at your Pinterest account like a library of sorts. 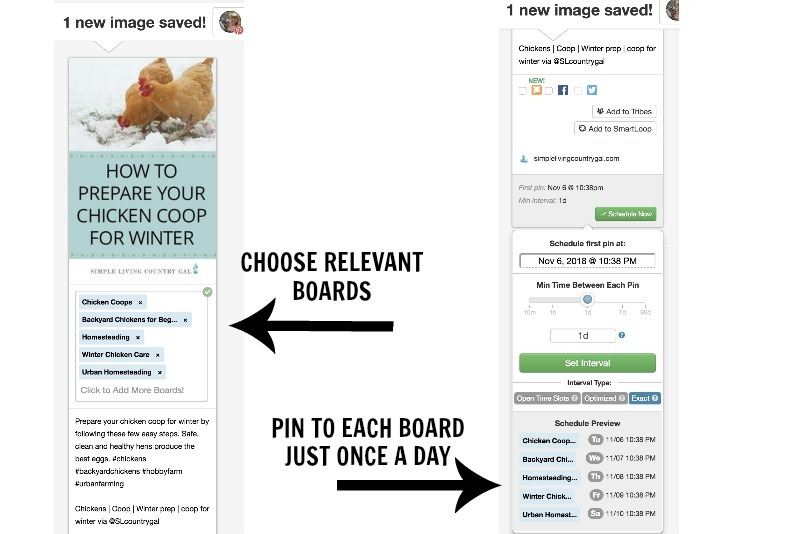 Each board is used to organize your (and other’s) content so your followers can find things quickly and easily. If you just wrote a blog post on 10 Ways to Train Your Dog Today, then putting it on a board that is called Gardening would not be smart at all. You want to get your content onto boards that are specifically related such as a board called Dog Training Tips. See, not so bad when we lay it all out into steps. Just 5 of them and even though as you grow you might include a few more steps in this process, the basis is still true. Write good content, make it clear what it’s about, and get it out there! Okay, you are here to learn about Tailwind and now that you know the basics of how to use Pinterest to get eyes on your things, let’s learn how to use Tailwind to get your pins out there easier. Tailwind is not a free service but you can get a trial offer so you can test the waters and see if this is something that you will need. You can use my link HERE to sign up and get started right now. Your queue is simply a list of posts that are both yours and other peoples that you are scheduling to go out at different and active times throughout the day using your blog’s Pinterest account. Basically, you are using your queue to mimic you, a real Pinterest user, in a way that looks natural so you don’t have to be pinning all the time. So, you will want to choose times that work for you and take advantage of peak times in your day. If you are not sure, Tailwind will suggest top time slots for you. This FREE little tool is something that will save you tons of time especially as you get bigger and the amount of boards you have grows as well. The video in step #4 will walk you through how to download the Extension and then exactly how to use it! Step #4 – Grab 3rd party content. 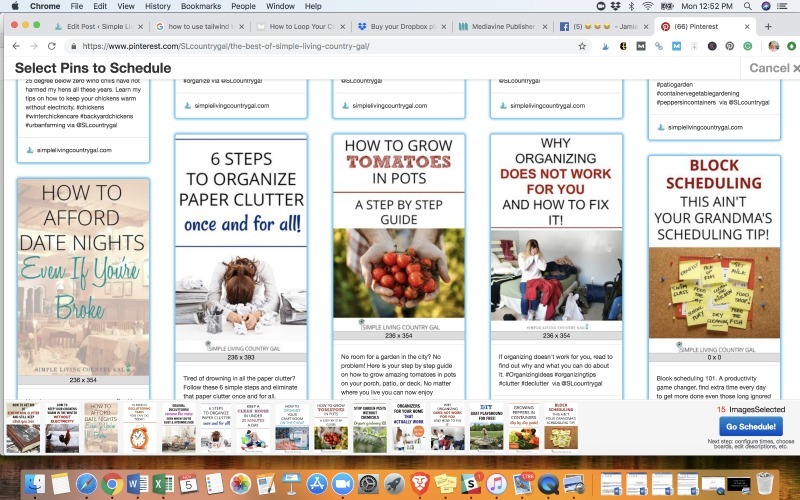 In Chrome, you will want to open up Pinterest and simply search for content that relates to your niche and the boards you have on your Pinterest account. When you have the results of your search, you will see a nice selection of pins. Next, hit the Chrome Tailwind Extention image in the upper right corner. That will give you a selection of pins you can grab to put into your queue. Highlight any pins that are a good fit, remember the steps I outlined above. Yes, those same steps hold true for other people’s pins and if you do not see good keywords you can adjust their description just a bit to read better. Once you have highlighted all the pins you want, hit schedule in the lower right corner. That will open up your Tailwind window and you can now choose the specific board for each specific pin. Once you have them all assigned to a board, hit the “Schedule Now” tab in the upper corner and you are done! You can watch this video on how to do these steps to see it all in action. 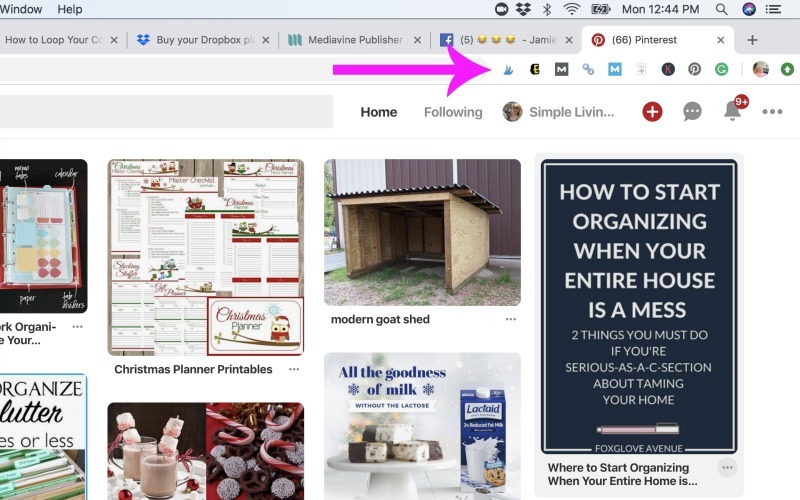 You can use the Chrome extension in the same exact way as above, only this time you are going to use it in your Best Of board where you house all of the pins that you have on Pinterest. Remember to correct any description errors and focus on your keywords better if needed. Step #6 – Schedule out one pin at a time. If you have new content that is not yet on your Best Of board, then you will want to schedule that manually or one at a time to just as many relevant boards that you have. Remember, each time you pin a keyworded pin to a keyworded board you are helping Pinterest better understand what your pin and content is about. Our goal is to get our content on the Pinterest Smart Feed which is the feed of pins that are shown to Pinterest users when they search for specific content. To do this, open up your pin, hit the Schedule tab for Tailwind, then select your boards that relate to your content. Since this is new content, you want to get your pins out to more boards (one each day in the beginning) without spamming. To do this you will want to use the interval tab at the bottom to select specific days and times for your new pins. Choose active times for your readers and make sure you have one time chosen for each day for as many relevant boards as you have. Wow, that was a mouthful and maybe a bit confusing? Just remember, you want your new content on related topic boards to help Pinterest understand what your content is about so you can get it out in front of more reader’s eyes so you can grow your blog traffic. Using Tailwind to grow your page views is such a game changer and one I encourage you to use today. There are so many things we need to do with our blogs, pinning daily does not have to be one of them. Now that does not mean I am saying to schedule all your things all the time………not even close. Manual pinning should always play a part when you are sharing your content so try to pin a few of your pins each day to give a natural feel to your pinning. Just a few seconds 2-3 times a day from your phone is enough to really amp up your Pinterest account. But don’t just share any old pin. Why not grab your very best performing pins in Google to make sure you are pinning exactly what you need to when you need to. These are the insider tips I learned a year ago and it really changed my Pinterest game. Pinteresting Strategies by my friend Carly is perfect for any blogger especially one that is serious about growing. And the best part is, she just redid it with all new relevant information! Check it out here, Pinteresting Strategies. Remember once those readers are on your blog, it is your job to snag them and turn them into dedicated subscribers for life. Subscribers that will read whatever you have to say and buy whatever you have to sell! Not sure how to do this? Read my post: HOW TO CREATE AN EFFECTIVE LEAD MAGNET TO GROW YOUR BLOG FAST and learn all my tips and tricks to growing a dedicated list of subscribers. 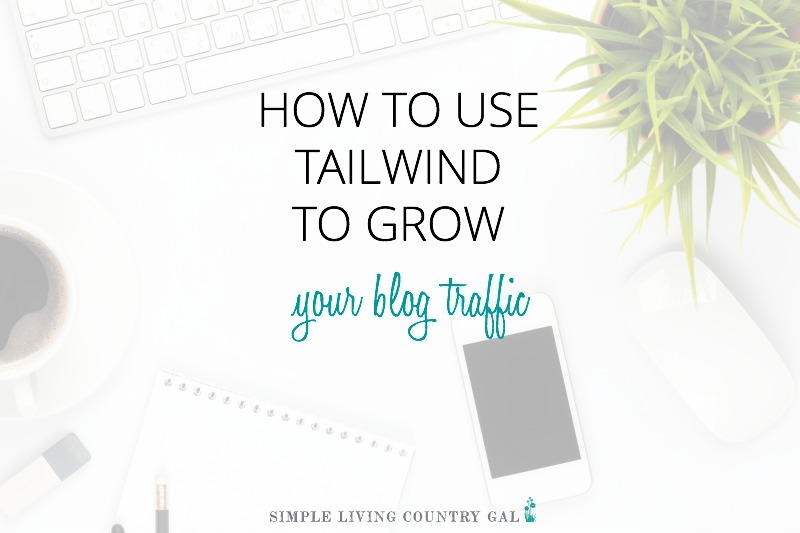 Learning How To Use Tailwind To Grow Your Blog Traffic is key to getting your blog up and off the ground so you can grow that blog into a full-time business today!